Find your perfect romantic accommodation in the Dandenong Ranges with one of our couples getaway packages for the perfect couple’s weekend escape. These 5-star exclusive spa and accommodation packages include accommodation, options of private mineral spring bathing under the stars, gourmet breakfast, a romantic three course dinner for two, spa therapies and private bathing in our opulent Roman Bathing Pool. Explore our range of memorable one night romantic accommodation packages in the Dandenong Ranges. Our one night romantic accommodation packages are the best Melbourne getaways for couples. Your exclusive mountain resort is located on 5 acres, and is designed for a select number of guests. 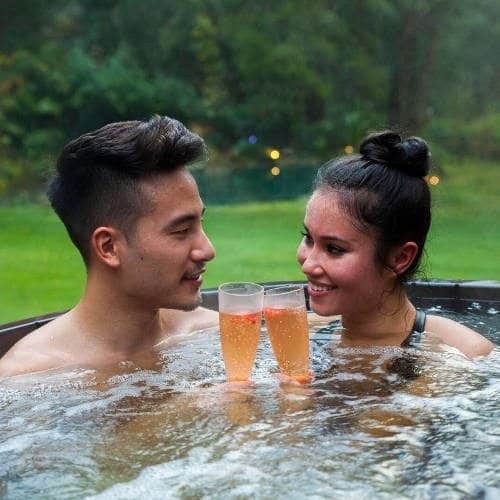 The private, landscaped resort, at the foot of the Dandenong Ranges allows couples to escape the city and experience relaxation and connection, away from other guests. To help set the scene, our romantic packages treat couples to luxury gifts, including roses, champagne, gourmet chocolate or drinks on arrival. Your romantic accommodation comprises a luxury Japanese style villa, with traditional shoji screens and tatami flooring – your own place of zen. For a longer romantic escape see our secluded romantic accommodation for two nights. Each romantic package offers a unique pampering experience for couples to enjoy during their one night stay. Packages include a range of hot mineral springs bathing, massage, or dayspa treatments. Each Japanese style villa has a private timber hot tub, where couples can bathe for an unlimited time in hot mineral water, overlooking the resort gardens. Other accommodation packages include outdoor bathing under the stars or indoor bathing in the Roman Bathhouse. All mineral springs bathing is completely private, allowing couples to bathe uninterrupted. Our mineral water is sourced naturally from within the rocky depths of the Dandenong Ranges. It is then heated to between 37 and 39 degrees, making it an ideal temperature to bathe and experience the health giving benefits. For more information about the composition of the natural mineral waters, see our Indoor Bathing and Outdoor Bathing pages. Our romantic accommodation is specifically designed to provide couples with an experience of relaxation and body pampering. All accommodation packages offer mineral springs bathing. Many packages also include a luxury spa treatment in our stunning treatment rooms, prior to dinner. Treatments include couples massage or the ultimate in spa retreat rituals – the romantic Arabian Steam Temple Journey. A romantic evening would not be complete without an intimate dinner and beautiful food to share. All our accommodation packages include intimate spa resort dining. Breakfast is also included. Couples dine in the restaurant overlooking the resort and experiencing the sites and sounds of the Dandenong Ranges.